Ant & Dec are an English TV presenting duo, consisting of Anthony McPartlin OBE (born 18 November 1975) and Declan Donnelly OBE (born 25 September 1975), from Newcastle upon Tyne, England. Formed after their meeting as actors on CBBC's drama, Byker Grove, they performed together as pop musicians PJ & Duncan, the names of their characters from Byker Grove. The duo have since led successful careers as television presenters, best-known for currently hosting Ant & Dec's Saturday Night Takeaway, I'm a Celebrity...Get Me Out of Here!, and Britain's Got Talent. Previous hosting credits include SMTV Live, CD:UK, Friends Like These, Pop Idol, PokerFace, Push the Button, Red or Black?, and Text Santa. They presented the annual Brit Awards in 2001, 2015 and 2016. In addition to presenting, the duo are actors and both had leading roles in the 2006 film Alien Autopsy. They have been television producers, and have their own production company, Mitre Television. When appearing together, they normally position themselves so that Ant is on the viewer's left, and Dec on the right. In a 2004 poll for the BBC, Ant & Dec were named the eighteenth most influential people in British culture. McPartlin and Donnelly met while working on the BBC children's drama Byker Grove in 1989. After a shaky start, they soon became best friends. They have achieved such popularity as a duo that they are hardly seen apart on screen. It is reported that they are each insured against the other's death, with the amount reportedly being around £1 million. Although Ant had gained some television experience with a brief stint on the children's television series Why Don't You?, which was broadcast on the BBC, Dec was the first of the two to acquire his place on the BBC children's drama Byker Grove. He joined in 1989, playing Duncan. A year later, Ant joined the cast to play PJ (series 2, episode 5). Their friendship began when their storylines collided, creating a friendship both on and off-screen. Dec also played a stable boy in the film adaptation of the novel The Cinder Path in his teenage years. They also went on to co-star in the 2006 sci-fi comedy movie Alien Autopsy. After leaving television, the duo turned their hand to pop music. Their first single was a song they performed while part of Byker Grove, entitled Tonight I'm Free. The single had some success, and the duo went on to record two albums under their character names of PJ & Duncan. Their most famous hit during this period was the BRIT Award nominated Let's Get Ready To Rhumble, for which the video and moves were choreographed by Mark Short, who had previously worked with Tina Turner and Peter Andre. For their third album, the duo reinvented themselves under their real names of Ant & Dec. The album featured their signature single "Shout". During their time, the pair released sixteen singles and three studio albums; however, none of their releases managed to reach number one, with their highest UK chart position being number three. The duo did, however, reach the top ten in Germany and Japan, and even had a number-one single in Germany, with their cover of the Everly Brothers' All I Have to Do Is Dream. Success also struck in other European countries. The duo had a short lived revival in the music industry, releasing a song for the 2002 FIFA World Cup, entitled We're on the Ball. The track peaked at No. 3, being beaten by Will Young and Gareth Gates. On 23 March 2013 Ant and Dec performed Let's Get Ready To Rhumble as part of their show Ant and Dec's Saturday Night Takeaway which powered the song to number one on the UK iTunes chart and on Sunday 31 March 2013 the track was revealed as the Official UK Number 1 single on The Official Chart on BBC Radio 1. All money made from the re-release was donated to charity. Ant & Dec got their first presenting job in 1994, while they were still releasing music under the alias of PJ & Duncan. They co-presented a Saturday-morning children's show entitled Gimme 5, which was broadcast on CITV. The show only lasted two series before being dropped from the airwaves. In 1995, the duo were once again offered a job on CBBC, this time presenting their own series, entitled The Ant & Dec Show. The series was broadcast from 1995 to 1996, and in 1996, Ant & Dec won two BAFTA Awards, one for 'Best Children's Show' and one for 'Best Sketch Comedy Show'. In 1997, a VHS release, entitled The Ant & Dec Show – Confidential, was made available in shops, and featured an hour of the best bits from two years of the programme, as well as specially recorded sketches and music videos. In 1997, the duo switched to Channel 4, presenting an early-evening children's show entitled Ant & Dec Unzipped. This show also won a BAFTA, but was dropped from the airwaves after just one series. ITV soon signed the duo in August 1998, and within weeks, were assigned to present ITV1's Saturday morning programmes SMTV Live and CD:UK, alongside old friend Cat Deeley. The duo presented the shows alongside Deeley for three years, becoming the most popular ITV Saturday morning show. The programme's success was the mix of games such as Eat My Goal, Wonkey Donkey and Challenge Ant, sketches such as "Dec Says" and the "Secret of My Success", and the chemistry between Ant, Dec and Cat. Two SMTV VHS releases, compiling the best bits from both shows, were released in 2000 and 2001 respectively. Ant & Dec also starred in the children's TV series Engie Benjy during their time on SMTV. Ant & Dec made their permanent departure from children's television in 2001 after trying out formats like Friends Like These for BBC One in 2000 and Slap Bang with Ant & Dec for ITV in 2001 (which was basically SMTV in the evening even playing Challenge Ant against adults). They have since said that the main reason they left SMTV was because the Pop Idol live finals were due to begin on Saturday nights on ITV in December 2001. Ant & Dec's first primetime presenting job came in the form of BBC Saturday-night game show Friends Like These, which was first broadcast in 1999 and made them known as presenters- a shift change from their acting days. The duo presented four series of the programme between 1999 and 2001. In 2001, the duo's contract with ITV was renewed for a further three years, following their appearances on SMTV Live and CD:UK, and received their first primetime presenting job on the station, presenting brand new Saturday night reality series Pop Idol and down to this success they had to leave SMTV behind. Pop Idol was broadcast for only two series before was replaced in 2004 by The X Factor, to which former Smash Hits editor Kate Thornton was assigned presenting duties. In 2005, as part of the ITV's 50th birthday celebrations, they were back on television fronting Ant & Dec's Gameshow Marathon, a celebration of some of ITV's most enduring gameshows from the past 50 years. They hosted The Price Is Right, Family Fortunes, Play Your Cards Right, Bullseye, Take Your Pick!, The Golden Shot and Sale of the Century. In 2002, Ant & Dec created and presented their own show, entitled Ant & Dec's Saturday Night Takeaway. The show has so far run for fifteen series, with the latest, including the 100th episode, airing in early 2018. The first series was not an overall success, but with the introduction of "Ant & Dec Undercover", "What's Next? ", "Ant v Dec" and "Little Ant and Dec", the show became a hit. During the fourth series, Dec broke his arm, thumb and suffered a concussion whilst completing a challenge for the 'Ant vs. Dec' segment of the show. The incident involved learning how to ride a motorbike and jumping through a ring of fire. During the challenge, Dec failed to pull hard enough on the throttle of the bike, causing it to topple over and sending him flying through the air. The accident caused the pair to miss the Comic Relief charity telethon of 2005. In 2006, the first episode of series five saw the duo abseil down the side of the 22-storey high London Studios, where the show was filmed. Two DVDs, a best-bits book and a board game of the series were released during 2004. The show was rested after 2009 as Ant & Dec said they were running out of ideas and it became stale, as many of the popular features such as "Little Ant & Dec" and "Undercover" were dropped. 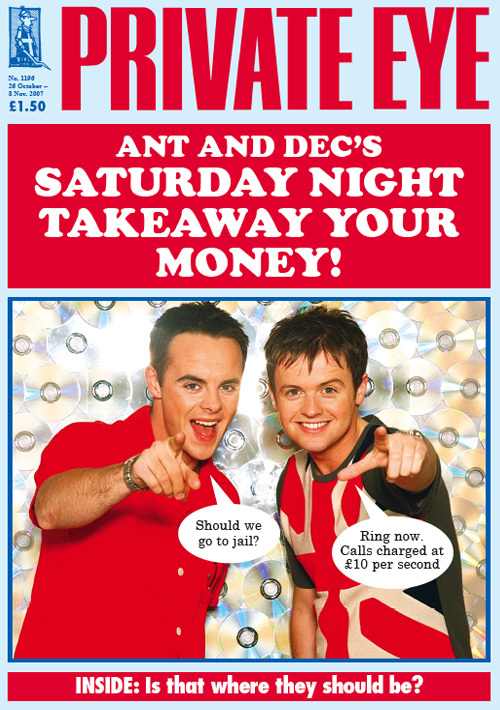 Saturday Night Takeaway returned in 2013 and was a massive success; Ant & Dec resurrected previous hit features such as "Undercover", "Little Ant and Dec" (albeit with a new Little Ant and Dec) Win the Ads and Ant v Dec, with new host Ashley Roberts. They also brought in new features such as the Supercomputer, Vegas or Bust, the End of the show 'show' where Ant and Dec perform with an act such as Riverdance or an Orchestra, and "I'm a Celebrity, get out of my ear!" where they have an earpiece in a celebs ear and they tell them what to do while being filmed by secret cameras. The series was such a success that ITV recommissioned it for 2014 even before the 2013 series ended. In August 2002, Ant & Dec fronted I'm a Celebrity...Get Me Out of Here!. They drew their highest viewing figures to date in February 2004: nearly 15 million tuned in to watch the third series. In May 2006, they were assigned to present coverage of the charity football match Soccer Aid. They were then invited back to present coverage of the second match in September 2008 but have been replaced by Dermot O'Leary from 2010 as the match clashed with Britain's Got Talent. In June 2006, they announced they had created a new game-show format for ITV, entitled PokerFace. The show featured members of the public gambling high stakes of money in an attempt to win the ultimate prize. The first series began airing on 10 July 2006, and was aired for seven consecutive nights. The second series was broadcast in early 2007, and saw a move to a prime-time Saturday slot. Ratings for the series fell to below 3.5 million, and the series was subsequently axed in March 2007. A board game of the format was released in 2008. In April 2007, the duo signed a two-year golden handcuffs deal with ITV, reportedly worth £40 million, securing their career at the station until the end of 2009. In June 2007, they were offered the job of presenters on new ITV reality platform Britain's Got Talent by Simon Cowell. The series features contestants aiming to win £100,000 and spot on the bill at the Royal Variety Performance, while performing and being judged by Cowell, actress Amanda Holden and former Daily Mirror editor Piers Morgan. The series was highly successful, drawing in nearly 12 million viewers, and led to the pair continuing to operate as hosts for future series, along with continual appearances in a regular feature on the ITV2 spin-off show Britain's Got More Talent. The pair filmed a series of six episodes for a new American game show, Wanna Bet?, in November 2007. The episodes was broadcast in 2008, but failed to attract enough interest for a second series to be commissioned. What You Wrote, another format created by the duo, was due to air in Autumn 2008 but was reportedly axed by ITV. In 2010, the duo debuted a replacement for Ant & Dec's Saturday Night Takeaway, entitled Ant & Dec's Push the Button. The series was a success albeit not in the same way as Saturday Night Takeaway, and a second run of the programme was broadcast in 2011 but Ant and Dec later dropped the show in favour of reviving Saturday Night Takeaway. Ant & Dec have also presented the game show Red or Black?, a creation of Cowell's, airing live on ITV in 2011 with a second series in 2012, but this was not a ratings success and was cancelled after the second series. On 24 December 2011, they presented ITV's charity initiative Text Santa with Holly Willoughby. Text Santa returned in 2012, 2013 and 2014 with Ant & Dec co-hosting alongside Christine Bleakley, Phillip Schofield, Holly Willoughby, Alesha Dixon and Paddy McGuinness. In January 2016, Ant and Dec presented When Ant and Dec Met The Prince: 40 Years of The Prince's Trust, a one-off documentary for ITV. In 2016, they also presented The Queen's 90th Birthday Celebration, broadcast live on ITV. In November 2016 the pair signed a new three-year deal with ITV estimated to be worth £30 million. In 2006, a celebration of the show Spitting Image saw Ant and Dec having their own puppets made. They have also been made into cartoon characters on the comedy show 2DTV, and face masks in Avid Merrion's Bo Selecta. Waxworks of the duo could once be found in London's Madame Tussauds. In April 2008, it was reported that Ant & Dec's production company, Gallowgate Productions, had purchased the rights to Byker Grove and SMTV Live, after the production companies that made them, Zenith Entertainment and Blaze Television, had both gone bankrupt in 2007. According to reports, the duo decided to purchase the rights to stop digital channels showing repeats of the programmes. On 28 September 2008, it was reported that the pair were attacked by the Taliban whilst in Afghanistan to present a Pride of Britain Award. In December 2008, the duo starred in a seasonal advert, their first in seven years, for the supermarket chain Sainsbury's. The duo appeared alongside chef Jamie Oliver. In March 2009, the duo filmed a short film for inclusion on Comic Relief, which highlighted their story upon visiting a community centre for young carers in the North East. In September 2009, the duo released their official autobiography, entitled "Ooh! What a Lovely Pair. Our Story". In October 2010, the duo appeared in several Nintendo adverts playing both the Wii and Nintendo DS. In 2011 and 2014, they both appeared on the ITV2 comedy panel show Celebrity Juice. From February 2013 to March 2015 they appeared in adverts for supermarket Morrisons. Between February 2016 and March 2018, they had appeared in adverts for car company Suzuki. In 2015, the pair made a cameo appearance on the U.S. adaptation of Saturday Night Takeaway, NBC's Best Time Ever with Neil Patrick Harris. The duo are also executive producers on the show. On 23 January 2019, the duo were awarded the Guinness World Record for “the most National Television Awards won consecutively for Best Presenter”. Law firm Olswang were commissioned to investigate the 2005 British Comedy Awards when the producers overturned the voting public's first choice, The Catherine Tate Show in favour of Ant and Dec's Saturday Night Takeaway for the People's Choice Award. The incident was also the subject of an investigation by media regulator Ofcom. selected an individual already known to the production team to be placed on the shortlist of potential winners and who went on to win the competition. The pair were ridiculed for their alleged participation in the fraud on the front cover of the satirical magazine Private Eye. On 10 September 2008, Ant & Dec announced that the frauds "will never happen again", insisting that a "high-tech system" and strict rules will ensure viewers cannot lose out with poorly monitored premium rate phone lines. On 30 September 2008, it was reported that Ant & Dec were being sued for $US30 million by Greek American stand-up comedian and actor ANT for using the name 'Ant' in the United States. The lawsuit, among other things, alleges trademark infringement and fraud. The suit was dismissed in May 2010. The pair have had a UK registered trademark for 'Ant & Dec' in the category of 'Entertainment services' since 2003. They have, albeit infrequently, returned to acting. They played themselves in the film Love Actually (in which Bill Nighy's character addressed Dec as "Ant or Dec"). They have returned to their Geordie roots in a one-off tribute to The Likely Lads and also by returning to Byker Grove for Geoff's funeral. In 1998, the pair starred in the pantomime Snow White and the Seven Dwarfs at Sunderland's Empire Theatre alongside Donnelly's partner at the time Clare Buckfield. The show was financially unsuccessful, making £20,000 less than it cost to stage, with the duo footing a large share of the shortfall. Ant & Dec's most recent acting appearance was in the film Alien Autopsy released in April 2006. The film gained positive reviews with critics praising the pair's acting performance, but lost more than half of its budget at the box office. It has since gained a cult following from fans of the pair. In 2013, they reprised their roles as P.J and Duncan on Ant & Dec's Saturday Night Takeaway. Brit Award Nomination – Best Song: "Let's Get Ready to Rhumble"
Most Popular Reality Programme I'm a Celebrity... Get Me Out of Here! Most Popular Entertainment Programme I'm a Celebrity... Get Me Out of Here! Challenge Show I'm a Celebrity... Get Me Out of Here! The Bruce Forsyth Entertainment Award I'm a Celebrity... Get Me Out of Here! 2002– I'm a Celebrity...Get Me Out of Here! An official Saturday Night Takeaway app known as Studio Rush launched on 30 January 2013. ^ "Ant and Dec set up new TV firm Mitre – named after Byker Grove pub |Showbiz|TV". The Sun. 3 March 2013. Retrieved 13 February 2014. ^ "A reminder for Sting...Every Able Dad Goes Bald Eventually". ^ Lawson, Mark (31 March 2018). "Saturday Night Takeaway: lonely Dec takes centre stage". The Guardian. Retrieved 8 November 2018. ^ BBC Tyne – Ant & Dec. BBC.co.uk (20 May 2008). Retrieved 5 May 2012. ^ Ant & Death. Mirror.co.uk (12 September 2006). Retrieved 5 May 2012. ^ Ant and Dec Biography. Members.tripod.com (29 August 1998). Retrieved 5 May 2012. ^ World Cup Archive. Everyhit.com. Retrieved 5 May 2012. ^ Robertson, James (31 March 2013). "Ant and Dec number one with Let's Get Ready To Rhumble in official UK singles chart". Daily Mirror; Trinity Mirror. Retrieved 1 April 2013. ^ BBC.co.uk – Geordie duo sign new ITV contract. BBC News (24 September 2004). Retrieved 5 May 2012. ^ Ant McPartlin (Alien Autopsy, A History Of Tyneside, Engie Benjy – Let's Go Team – Episodes 7 To 13 and Engie Benjy – Makes Things Better!) Archived 11 June 2011 at the Wayback Machine. Lovefilm.com (12 April 2006). Retrieved 5 May 2012. ^ Declan Donnelly (A History Of Tyneside, Alien Autopsy, Engie Benjy – Let's Go Team – Episodes 7 To 13 and Engie Benjy – Makes Things Better!) Archived 11 June 2011 at the Wayback Machine. Lovefilm.com (12 April 2006). Retrieved 5 May 2012. ^ Ant & Dec ITV Sunday Axe. The Sun (United Kingdom).co.uk (23 March 2008). Retrieved 5 May 2012. ^ "Ant and Dec to present landmark Royal documentary for ITV". ^ "Ant and Dec to host The Queen's 90th Birthday Celebration". ^ Sweney, Mark (14 November 2016). "Ant and Dec sign £30m 'golden handcuffs' deal with ITV". The Guardian. ISSN 0261-3077. Retrieved 17 January 2017. ^ "Ant & Dec go to Buy-ker Grove?". The Sun. 11 April 2008. Retrieved 11 April 2008. ^ "Ant and Dec: Suzuki ends advertising campaign after drink-drive charge". BBC News. 23 March 2018. Retrieved 25 March 2018. ^ "Watch Best Time Ever Episodes". NBC. ^ "Rod Stewart heads entertainment honours". BBC. 10 June 2016. ^ Gibson, Owen (9 May 2008). "And the winners aren't ... Ant and Dec". The Guardian. London. ^ a b "Ofcom fines ITV plc for misconduct in viewer competitions and voting" (Press release). Ofcom. 8 May 2008. Archived from the original on 13 May 2008. ^ "Ant and Dec's Saturday Night Takeaway Your Money!". Private Eye. 26 October 2007. ^ Blackburn, Jen (10 September 2008). "Ant and Dec: No rip-offs". Archived from the original on 13 May 2009. Retrieved 15 May 2017. ^ The Likely Lads. BBC. Retrieved 5 May 2012. ^ BBC Press Office – Byker Grove to close its doors after seventeen years. BBC. Retrieved 5 May 2012. ^ PJ & Duncan Return. Youtube.com (29 February 2008). Retrieved 5 May 2012. ^ "h2g2 – Ant and Dec – British Television Presenters". BBC. Retrieved 12 March 2012. ^ "British Comedy Awards 2006: The Winners – TV News". Digital Spy. 13 December 2006. Retrieved 12 March 2012. ^ Television – News – British Comedy Awards 2006: The Winners. Digital Spy (13 December 2006). Retrieved 5 May 2012. ^ "Ant and Dec top children's awards". BBC News. 14 September 2008. Retrieved 25 April 2010. ^ "Ant and Dec win trio of TV awards". BBC News. 15 October 2002. Retrieved 25 April 2010. ^ "National TV Awards 2006: Full winners list – TV News". Digital Spy. 31 October 2006. Retrieved 12 March 2012. ^ "National Television Awards: The Winners – TV News". Digital Spy. 30 October 2008. Retrieved 12 March 2012. ^ "Ant and Dec's Geordie Christmas (1997)". ^ "Ant & Dec will trace their ancestry in ITV special". 26 May 2017. Retrieved 29 April 2018.